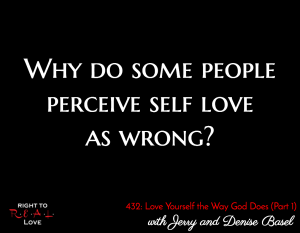 In this episode, Jay is joined by authors Jerry and Denise Basel to address the question: Why do some people perceive self love as wrong? Do the majority of people love themselves the way that God does? Do most people believe it’s possible to love ourselves the way God does? Why do some people perceive self love as wrong? Why many people struggle with loving themselves. Reasons why believers in Jesus Christ struggle with loving themselves. Why God desires us to love ourselves the way He loves us. How we limit God’s ability to work through us when we don’t truly love ourselves. Jerry and Denise open up about what led them to write a book on loving ourselves the way God loves us.